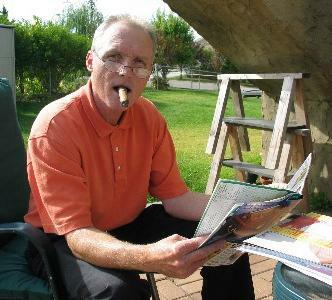 My friend Larry, pictured above smoking a cigar, invited me over to his house today to discuss his website. While we were walking inside, all these ladybugs started pestering us, and Larry said that one of them bit him. Is this normal? I think a ladybug landed on me and bit me yesterday. Lexington apparently is ladybug vacationland right now. Bethany told me that she has a line of ladybugs on her window that just travel back and forth and back and forth. I wonder what's going on. UPDATE: Ariana just wrote to say that these aren't ladybugs; they are Japanese beetles. Did a quick search on Google and found that a lot of people confuse this particular type of beetle for a ladybug. And I also learned: "They do not 'bite'. Instead, they have sharp hooks on their feet, so when they land on you, they dig in, and it feels like a bite." Thanks, Ariana! Thanks, Google!